Akshay Nanavati was born in India, moved to Singapore when he was 8, then the US when he was 13. Within a short time, he got himself into drugs and alcohol. He and his friends were so heavily immersed in that world of darkness that he lost two friends to that lifestyle. The movie “Black Hawk Down” inspired Akshay to stop living such a meaningless existence. Almost overnight, he stopped doing drugs, joining the Marines to serve in an institution where the good of the group meant more than his own personal well-being. This proved to be a major challenge, taking him a year and a half to get into the Marines because doctors told him that bootcamp would kill him because of a blood condition he has, Thalassemia. He not only survived, but graduated as the honor graduate in Infantry School. Since then, Akshay has been mountaineering all over the world, glacier caving in the Himalayas (where he was almost killed by a falling boulder), cave diving, ice diving, skydiving, and he has dragged a 190-pound sled 350 miles across the second largest icecap in the world for one month in temperatures as low as -40 degrees. He also spent 7 months fighting the war in Iraq, where one of his jobs was to walk out in front of the vehicle convoys to find improvised explosive devices before they could be used to blow up the vehicles. Upon returning home, with a diagnosis of PTSD, Akshay struggled with alcohol addiction until he found himself on the brink of suicide. Akshay spent years studying neuroscience, psychology and spirituality to not only heal his own brain, but figure out how does everyone live happy and meaningful lives. This led to the creation of Fearvana, which he defines as the bliss that results from engaging our fears to pursue our own worthy struggle. Akshay then wrote a book, Fearvana: The Revolutionary Science of How to turn fear into health, wealth and happiness.” He was blessed to receive a foreword from His Holiness, the Dalai Lama, who said “Fearvana inspires us to look beyond our own agonizing experiences and find the positive side of our lives.” The book is endorsed by people like Seth Godin, Jack Canfield, Marshall Goldsmith, the Dalai Lama and Steve Olsher. Akshay runs a successful global business helping people unleash their potential to live limitless lifestyles through coaching, consulting, public speaking, transformational workshops, online training courses and his book, while also starting a nonprofit called “The Fearvana Foundation”. He donates all the proceeds from his book to charity. 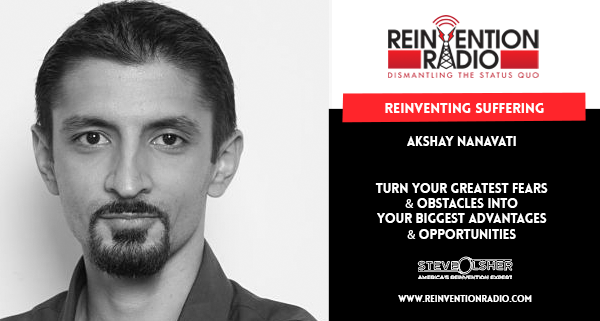 TUNE IN to hear Akshay discuss with Steve, Mary and Richard how to turn your greatest fears and obstacles into your biggest advantages and opportunities. – The Dalai Lama endorsed and wrote the whole foreword for his book, Fearvana. – Why were you so into drugs? – What is your worthy struggle? Reinventing Domestic Abuse – In this episode, Rosie Aiello details of her international escape, why her ex-husband is still stalking her, and her best advice to women who are still suffering to move forward from domestic abuse.